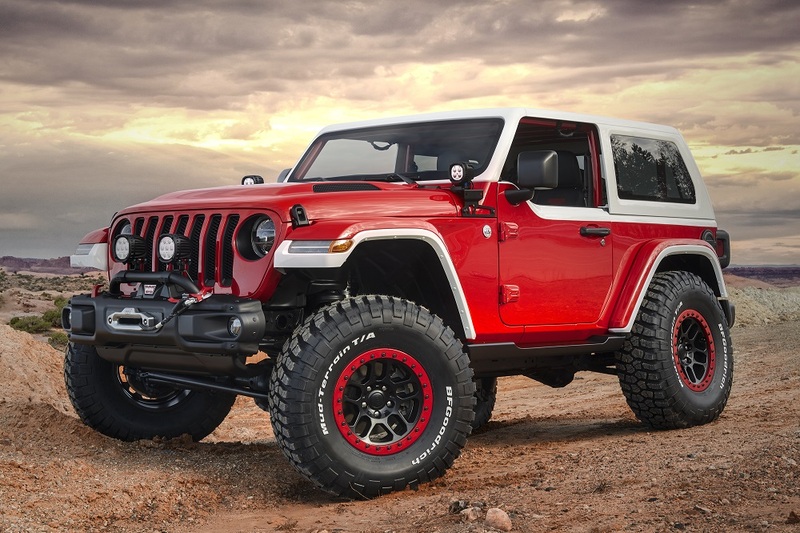 Jeep pulled the wraps off several brand-new concept vehicles it's taking to the 52nd Annual Moab Easter Jeep Safari, but one of the coolest, by far, is a red and white 2018 Jeep Wrangler dubbed "Jeepster." The off-road vehicle segment is hot nowadays, and with off-road-inspired vehicles ranging from capable SUVs like the Toyota 4Runner to pickups like the Ford F-150 Raptor, it's also getting pretty darn crowded. Oh, and just wait until the new Ford Bronco arrives. No offense to all of those other vehicles, but they are mere distractions in a segment that only has one true off-road hero—the Jeep Wrangler. Let's face it, it may not be the most practical, the most comfortable, and definitely not the prettiest (although this concept is downright gorgeous), but if you want to traverse some serious terrain, it's the only worthy option. The Jeepster concept utilizes the sleek new lines of the 2018 Wrangler Rubicon as a foundation to which the color palette and speedy styling of the 1966 Jeepster were applied. The lovely two-tone paint-job is characterized by a Firecracker Red body with a Bright White hardtop and body accents. The traditional Jeep badges were also replaced with a unique tri-color Jeepster hard badge. Believe it or not, the beauty of the Jeepster isn't just skin-deep. Sure, the top may have been shortened by two inches and the windshield raked by 2.5 degrees in the name of panache, but everything still remains functional, and in this case, removable and foldable. Other unique attributes that enhance looks and performance include LED off-road lights that shine bright at up to 8,000 lumens, and a concept tubular roll cage that holds an additional tire and wheel. You know, just in case. Lastly, no badass Jeep would be complete without giving the suspension some extra love. The Jeepster received a two-inch lift kit and 2.5-inch in diameter aluminum body shocks. The complex and capable setup complements the oversized, 37-inch BF Goodrich Mud-Terrain tires that sit on beadlock-capable 17-inch wheels. We've reached out to Jeep for more on the Jeepster, and we will update this story when we hear back. Heck of a job, Jeep, heck of a job. An electrified version of the smallest Jeep could be coming soon.